Let’s talk about terminology first. Major part of the literature on Java operates with such terms as inner classes and nested classes. Throughout this article we will be talking mainly about nested classes of which inner classes are a subset. Nevertheless frequently when talking about inner classes people mean all nested ones. Such a paradox. All nested classes may be divided into static (StaticNestedClass in the above example) and non-static ones. Non-static nested classes are frequently referred to as simply inner classes. Regarding an outer class we will use a framing class and an outer class notions interchangeably. Static nested classes do not have access to non-static fields and methods of the corresponding framing class which makes them to some extent analogous to static methods simply declared inside the class. Non-static fields and methods may be accessed only through a reference to a framing class instance. In that static nested classes are very similar to any other high-level classes. For any question (the class Question) a "question type" notion (the class Type) is straightforward. An alternative approach, namely a higher-level class QuestionType creation, would be much less expressive (at least in the context of a class Question). The thing is that after the given code is compiled we will get 2 files - ClassToTest.class and ClassToTest$Test.class. Interesting that class ClassToTest will contain no information about its nested class (unless we call nested class’s methods which we do not need for tests), so ClassToTest$Test.class can be simply deleted by a build script later. An inner class cannot have any static declarations. Instead of that the static methods may be defined inside the framing class. Besides that such classes cannot contain enums declarations inside. meaning that static modifier will be added implicitly. method() call from anotherMethod will call an InnerClass method. The following construction should be used to access the framing class method - OuterClass.this.method(). Local classes are defined inside a Java code block. On practice the definition most frequently takes place inside some other class’s method. Even though local class may be defined inside both static and non-static initialization blocks. This code (with some modifications though) was taken from a real project and is used for get web requests processing. It introduces new abstraction which is convenient to work with from inside the method and which is not needed outside of it. Just like member classes, local classes are associated with the framing class instance and have access to its fields and methods. Apart from that local classes have access to local variables as well as parameters of the method if they are declared with a final modifier. By the way, interfaces cannot be defined locally because of the same reasons they cannot be declared inner. Anonymous classes play important role in every Java-programmer’s life. Those are local classes without their names. Since an anonymous class is a local class as well, all the local class restrictions apply to it. 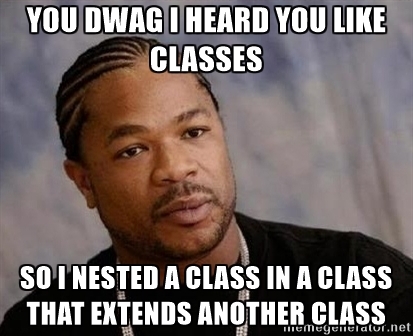 Class name is doesn’t matter and doesn’t facilitate the code understanding. That is probably it. It should be probably mentioned that if all the opportunities that nested classes provide are used wisely, your code will become cleaner, shorter and much more understandable.